The BC Wheelchair Basketball Society (BCWBS) honoured the accomplishments of its members at an annual awards night, which took place March 3rd at the banquet for the BC Division of the Canadian Wheelchair Basketball League finals. Athletes, coaches, officials and partners from around the province were in attendance. This is the inaugural year of MJ’s True Sport Award, which honours former women’s national team member MJ Boudreault, who passed away last year after a battle with cancer. The award is given to someone who best displays MJ’s dedication to sport and training, leadership, and competitive drive. BCWBS is committed to creating awareness of disability issues and has provided support to wheelchair basketball programs throughout British Columbia. For over twenty-five years, BCWBS has delivered exceptional integrated and inclusive programs and experiences to people with and without physical disabilities and to all age groups. BCWBS promotes opportunities for participation, recreation, competition, and excellence in the sport of wheelchair basketball. Prestigious alumni include Eugene Reimer, Terry Fox, Rick Hansen and Marni Abbott-Peter. Junior Athlete of the Year: Jack Kosterman. Jack is one of BC’s rising stars in wheelchair basketball. At only 13, he was selected to represent BC at the 2011 Canada Winter Games. He has also been identified as part of the junior national team program. Jack plays locally at both the Langley and Surrey junior programs and attends all junior camps and tournaments. His work ethic is second to none and he embraces all training opportunities, even cross-training in sports like tennis and skiing. Despite his age, he is a mentor to other young people with a disability. Female Athlete of the Year: Jessica Vliegenthart. 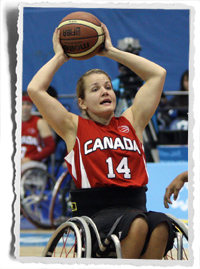 Despite her busy schedule as a member of the Canadian women’s wheelchair basketball national team and BC Women’s Provincial Team, in 2011 Jessica Vliegenthart was a key contributor to the Victoria Wheelchair Basketball team’s D2 championship win and was named an all-star. She also took on a key role in Victoria as a basketball rep and her energy has helped take the basketball program to new levels. In 2011 she was named Athlete of the Year at the Celebration of Women in Sport in Victoria. She recently celebrated her graduation from the University of Victoria law school and now sets her sights on the London 2012 Paralympics, where she will represent Team Canada. Male Athlete of the Year & MJ’s True Sport Award: Robert Hedges. Robert “Bo” Hedges is a fantastic representative of the sport both on and off the court. He’s on both Team BC and Team Canada, but still makes himself available to junior programs, local programs and other promotional opportunities. He is the most active mentor the junior program has and frequently allows kids to handle his medals and Paralympic Torch. His strong work ethic has led him to train in Alabama full-time, but he still serves as a BCWBS board member. In 2011 he helped lead his team to a silver medal at the CBWL Finals where he was named an all-star and played an enhanced role with the BC Men’s team in their gold medal victory at Nationals where he was also named to the all-star team. Bo is also a member of Team Canada and after years of dedication and training is playing a key role on that team and will represent Canada at the 2012 Paralympic Games in London this summer. Volunteer of the Year: Karin Kratz. Karin has been the driving force behind bringing wheelchair basketball to the Comox Valley. She arranged for gym time at the Comox Recreation Centre gym, got the staff on board, talked wheelchair basketball up with her friends, folks on the street and with local newspapers, begged and borrowed to get equipment and even advanced personal finances and managed the club’s finances to get and keep the game going. In June 2009, Karin collected enough support from individuals for the creation of the Comox Valley Wheelchair Sport Society. Karin completed all the administrative work required, including writing the constitution and by-laws, and registering with the Corporate Registry. Currently, she sits as President of the Board. Coach of the Year: Brag Hagkull. As both a parent and a coach, Brad Hagkull has worked tirelessly to inspire young people with disabilities to participate in wheelchair basketball. He is a driving force behind the Chilliwack Cheetahs Junior Program and has volunteered at every event, including organizing the Langley Gold Rush Invitational Game Night. Brad has a great sense of humour and is known for motivating young athletes and making practices fun. Brad has also honed his coaching skills by taking part in several developmental seminars and attaining his coaching certification. Official of the Year: Conston Parchment. Conston was nominated by head official Dean Mackinnon due to his willingness to learn and his level of commitment and availability to our programs and games. Whether it’s helping the participants at the Tim Frick City League to understand the rules or taking part in clinics or training opportunities, Conston is known as the “go to guy” around the wheelchair basketball community. Conston is always learning more about the sport and is currently taking on new challenges to hone his skills as a referee. Special Recognition Award: Frances McLean. Despite the fact that she is “79 years young,” Frances McLean contributes in an exceptional manner both on and off the court. Since stricken with severe arthritis and having undergone leg surgery, all thoughts of playing basketball were buried until Fran found wheelchair basketball 3 years ago. She now rarely misses a practice with the Comox team and takes advantage of her six-foot frame and able-bodied basketball experience to mentor other players. Fran also contributes off the court as a director on the Board and is willing to help out whenever asked. Community Support Award: Rhonda Konishi / Save on Foods. Rhonda Konishi and Save-on-Foods have been supporting BCWBS since 2003. They have annually supported the Junior Challenge Tournament as well as many national events in the last few years through food donations and welcome bags. As many of you know, Rhonda’s son Nick played basketball with us but even after he stopped playing, Rhonda and Save-On-Foods generously continued to support us. They are always willing to help our sport and our community whenever we ask for their support and have become one of the most reliant community partners. To get involved or learn more about BCWBS events and programs, please visit www.bcwbs.ca. The BC Wheelchair Basketball Society (BCWBS) is a non-profit organization, formed in 1983 and registered with Revenue Canada as a charity since 1985. Since its inception, the society has been a catalyst in creating awareness about disability issues and has provided support to wheelchair basketball programs throughout British Columbia. Our programs are offered to people who have physical disabilities and people who do not, and to all age groups. Wheelchair basketball is for anyone who wishes to participate.